Close-up of a waffle. Waffles look like squares with smaller squares on them. 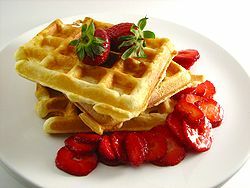 In North America, waffles are often eaten for breakfast on weekends or holidays. Freshly-baked waffles are topped with maple syrup and served with breakfast sausages, eggs, orange juice, and hot coffee. In Belgium, France, and the French-speaking Canadian province of Quebec, waffles are often served as a dessert, after dinner is finished. Freshly-baked waffles are topped with sweet toppings such as chocolate syrup, bananas, strawberries, or whipped cream. American waffles are often made from a batter leavened with baking powder and may be round, square, or rectangular in shape. They are usually served as a sweet breakfast food, topped with butter and maple syrup, bacon, and other fruit syrups, honey, or powdered sugar. They are also found in many different savory dishes, such as fried chicken and waffles or topped with kidney stew. Waffles were first introduced to North America in 1620 by Pilgrims who brought the method from Holland. Belgian waffles, or Brussels waffles, are made with a yeast-leavened batter. It is generally, but not always, lighter, thicker, and crispier and has larger pockets compared to other waffle varieties. They are easy to tell the difference from Liège Waffles by their rectangular sides. In Belgium, most waffles are served warm by street vendors and dusted with confectioner's sugar. In tourist areas they might be topped with whipped cream, soft fruit or chocolate spread. Despite their name, 'Brussels waffles' were actually invented in Ghent in 1839. They were introduced to America by restaurateur Maurice Vermersch. He sold Brussels waffles under the name "Bel-Gem Waffles" at the New York's 1964 World's Fair. The Liège waffle (from the city of Liège, in eastern Belgium) is a richer, denser, sweeter, and chewier waffle. It was invented by the chef of the prince-bishop of Liège in the 18th century, It has chunks of pearl sugar which caramelize on the outside of the waffle when baked. It is the most common type of waffle in Belgium. It is made in plain, vanilla and cinnamon varieties by street vendors across the nation. Bergische waffles, or Waffles from Berg county, are a specialty of the German region of Bergisches Land. The waffles are crisp and less dense than Belgian waffles. They are always heart shaped. They are served with cherries, cream and sometimes rice pudding as part of the traditional afternoon feast on Sundays in the region. Hong Kong style waffle, in Hong Kong called a "grid cake" or "grid biscuits" (格仔餅), is a waffle usually made and sold by street hawkers and eaten warm on the street. It is similar to a traditional waffle but larger, round in shape and divided into four quarters. It is usually served as a snack. Butter, peanut butter and sugar are spread on one side of the cooked waffle. Then it is folded into a semicircle to eat. Eggs, sugar and evaporated milk are used in the waffle recipes, giving them a sweet flavor. They are generally soft and not dense. Traditional Hong Kong style waffles are full of the flavor of yolk. Sometimes different flavors, such as chocolate and honey melon, are used in the recipe and create various colors. Another style of Hong Kong waffle is the eggette or gai daan jai (鷄蛋仔), which have a ball-shaped pattern. Pandan waffles come from Vietnam. They use pandan flavoring and coconut milk in the batter. The pandan flavoring gives the batter a spring green color. When cooked, the waffle browns and crisps on the outside and stays green and chewy on the inside. Unlike most waffles, pandan waffles are usually eaten plain. Scandinavian style waffles, common throughout the Nordic countries, are thin and made in a heart-shaped waffle iron. The batter is similar to other varieties. The most common style are sweet, with whipped or sour cream and strawberry or raspberry jam, or berries, or simply sugar, on top. Stroopwafel are thin waffles with a syrup filling. They were first made in Gouda in the Netherlands during the 18th or 19th century. The stiff batter for the waffles is made from flour, butter, brown sugar, yeast, milk, and eggs. Medium-sized balls of batter are put on the waffle iron. When the waffle is baked and while it is still warm, it is cut into two halves. The warm filling, made from syrup, brown sugar, butter, and cinnamon, is spread in between the waffle halves, which glues them together. They are popular in Belgium and the Netherlands and sold in pre-prepared packages from local supermarkets. Waffle is also a slang term meaning "to keep changing one's mind.". For example, if a reporter is asking a politician a question, and the politician does not give a clear answer, the reporter might say that the politician was "waffling." It can also mean to keep repeating the same information in a different way or make no useful points. ↑ "American waffle recipe". Lonestar.texas.net. Retrieved 2012-05-02. ↑ "Brussels Waffle recipe". Fourman.dsl.pipex.com. Retrieved 2012-05-02. ↑ "Liège waffle recipe". Fourman.dsl.pipex.com. Retrieved 2012-05-02. ↑ Name (required) (2008-01-23). "Descriptions of Hong Kong Waffles". Mrnaomi.wordpress.com. Retrieved 2012-05-02. ↑ Katharine Shilcutt (July 2, 2011). "100 Favorite Dishes: No. 81, Pandan Waffles at Parisian Bakery III". Retrieved November 5, 2011. ↑ Hong & Kim (January 15, 2011). "Pandan Waffles Banh Kep La Dua". Retrieved November 5, 2011. This page was last changed on 6 July 2018, at 16:31.